In 2011, we published a photo of a Focke Wulf Fw 190 A-5 wreck with a US serviceman standing in front of it (see photo no. 35 on page 39 of our ‘Captured Eagles Vol. I’). [a] The location and unit could not be ascertained at that time. Meanwhile, we have found another photo of the same aircraft in an album that the daughter of Walt Pugh, who was a ward master in a surgery ward, has kindly shared with us. [b] At the beginning of 1943, Walt Pugh was stationed in North Africa and was attached to the 26th General Field Hospital. The new photo is shown above. The caption on the back stated ‘Captured German Plane Africa 43’. 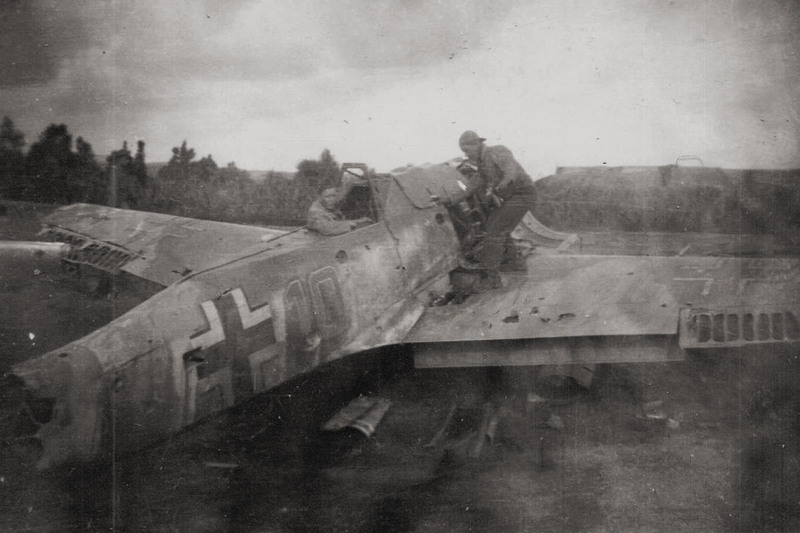 The captions and context of the remaining photos in the album allowed us to determine that this Fw 190 was most likely found near Bizerte at either the Sidi Ahmed or Karouba airfield around May 1943. These two airfields were only about 3 kilometers apart. The Germans left many aircraft behind at these two airfields when they retreated to Sicily at the end of April and beginning of May 1943. Based on a list of captured German aircraft at Sidi Ahmed and Karouba prepared by British air intelligence units, the Fw 190 was almost certainly Fw 190 A-5 W.Nr. 903 (see photo below). [c] Only the last 3 digits of the aircraft’s serial number were indicated in the intelligence report. It could have been either Fw 190 A-5/U8 W.Nr. 0150903 or Fw 190 A-5 W.Nr. 0155903. Comparing the markings with other Fw 190s that operated in Tunisia (JG 2, Sch.G. 2 and SKG 10), it is quite certain that the aircraft belonged to III./SKG 10. The shade of grey of the yellow fuel triangle matches perfectly with the shade of grey of the tactical code and hence it can be assumed that the code was yellow. Yellow codes were used by the 11. Staffel of SKG 10. 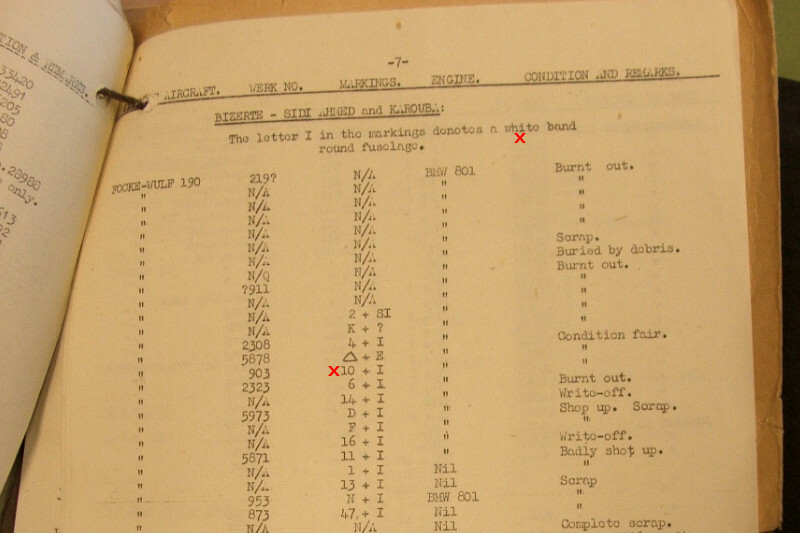 According to the British air intelligence report, the fuselage band was white. It looks darker in the photo, but that is most likely due to dirt and exposure to the elements. Fw 190s of III./SKG 10 in Tunisia usually carried a flying arrow emblem on the port side of the engine cowling and a white propeller spinner. It is possible that also ‘Yellow 10’ featured the emblem and the white spinner, which made it quite an attractive looking fighter plane. The excellent book “Fw 190 in North Africa” by Morton Jessen and Andrew Arthy indicates that this aircraft was damaged on 29 March 1943 after combat with Kittyhawks from No. 260 Squadron RAF. [d] It is unclear if it was repaired after that or if it was left behind damaged before III./SKG 10 retreated to Sicily.